Illustration shows jacket fastened with link buttons at waistline. collar has 1-1/4” stand at center back, and 1” stand at shoulder seam. upper collar and front facing are in one piece, with seam at center back. jacket is a 7 gore style. 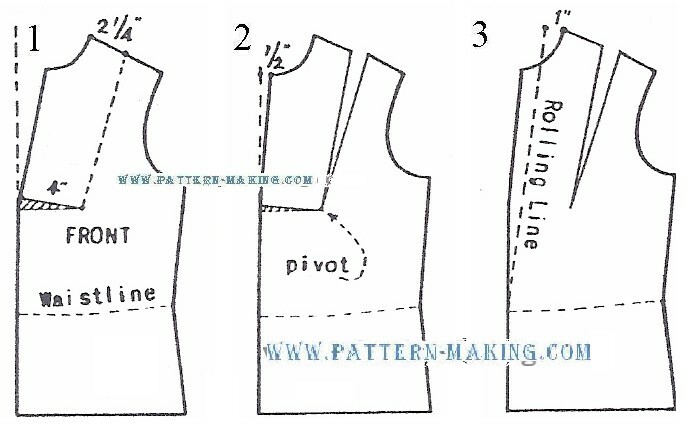 1) using the jacket foundation, mark position for seam in front, from shoulder to breast point; then draw a straight line at center front, as shown by dotted line. 2) swing upper part . . .